Welcome to the new week friends. I hope you're all feeling refreshed and rejuvenated. I know I am! That extra hour of sleep we gained Saturday night certainly helped. 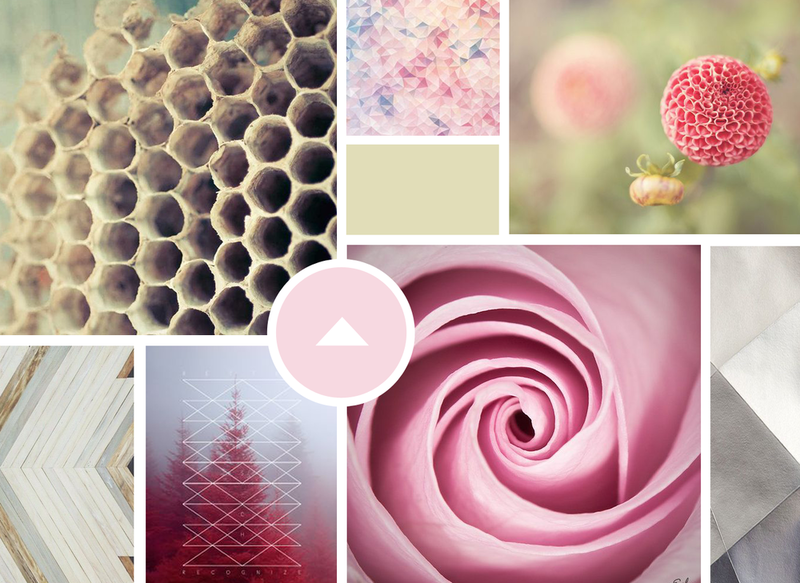 For this month's theme of Moodboard Monday, Brooke and I chose Geometric. Of all the moodboards I've made, this one might have been the most creatively challenging but also the most satisfying. One I can sit back and look at and think "Oh yes. That's the mood I was going for." I wanted to find a meaning in all these shapes I was discovering, and so I began looking in nature. After all, that's where it all began, right? Physical objects came long after. So that's where I rooted this moodboard. As soon as I found the honeycomb image, the rest came easy. When I think of the word "geometric," the words sharp, edgy and intricate come to mind. But I wanted to tone it down a bit. Keeping with the boldness of the pink, the rest of this one is more muted and soft. I think I related this one to my personality a bit. I'm not a loud or bold person, and so I put a little more of who I am into this one. What do you think? How do you add your personality to your work? Brooke and I would love for you to join us! Leave the link to your post below for all of us to see! And don't forget to check out Brooke's moodboard this month!